sugarcane farmers in Bilaspur, Durg, Rajnandgaon and Kabirdham districts of Chhattisgarh are angry at the state government for forcing them to sell their produce at throwaway prices to the state's only sugar mill. The mill, located in Kawardha, needs at least three lakh tonnes of cane every year. Since the supply always falls short, the commissioner of agricultural directorate invoked sections 15 and 16 of the Sugarcane Act 1958, to reserve the harvest of Bilaspur, Durg, Rajnandgaon and Kabirdham districts to supply the mill. The farmers say they have been banned from preparing gur (jaggery) from sugarcane even for personal use. The state government has even filed a caveat in the high court on the issue. The farmers feel cheated. Last year, the state government encouraged them to grow commercial crops like sugarcane and soyabean, by suggesting high profits. Hundreds of small and marginal farmers were lured into cultivating sugarcane for the first time. Good monsoon ensured a high yield of sugarcane and the farmers were happy. But then came the crunch. The local tractor and lorry owners had increased transportation charges by 30 per cent anticipating the growing demand for their vehicles in the harvest season. On reaching the mill, farmers had to wait 2-3 days in long queues to sell their produce. And all this for a paltry sum: for while the open market offered Rs 200-250 per quintal, the mill gave a mere Rs 83 per quintal. "The government cheated us by giving false information about the prospects of sugarcane. 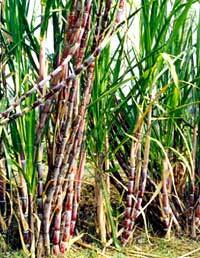 I took loan to grow sugarcane and had to suffer huge losses. I vow not to grow it again," says Eshwari Dhurve of Kabirdham. The mill also demanded cane with a particular percentage of sugar content in it. But traditional farming done by these farmers (they don't use hybrids) makes the sweetness of the cane less than required. Sugarcane cultivation is not new for the farmers of Birkona and Navgaon in Kabirdham district. For decades, it was grown in a limited area along with traditional paddy and chana, under crop rotation. The farmers processed the sugarcane traditionally through charkhas to prepare jaggery, which was supplied to local markets all over the state. The farmers say the g ur preparation gave Rs 15,500 per acre while the government price works out to just about Rs 4,700 per acre.